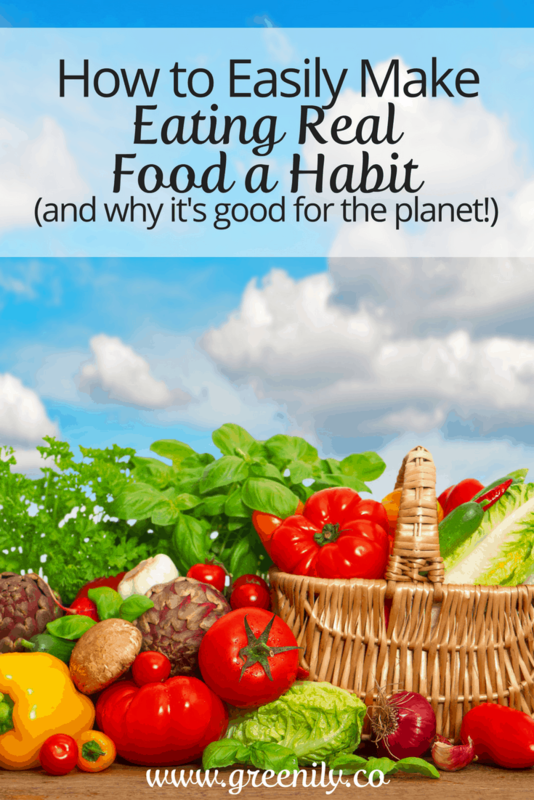 Eating Real Food Is A Great Green Habit! Disclosure: This post contains affiliate links. This means I may make a small commission if you purchase something, and doesn’t change your purchase in any way. 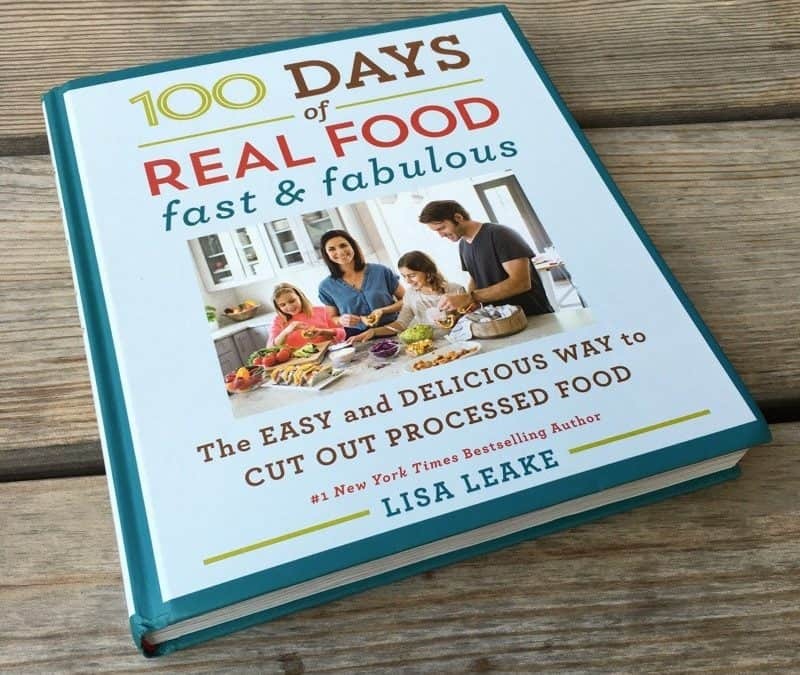 I’m so excited because I’ve been selected as a 100 Days of Real Food Cookbook Ambassador! As a Cookbook Ambassador I received an advance copy (available October 25) of Lisa Leake’s new cookbook Fast & Fabulous and had the chance to try out some of her new recipes! Yum!! 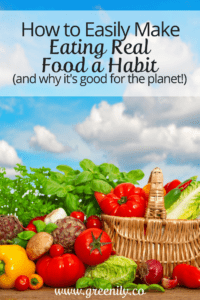 Not only am I excited to promote a great cookbook since I have been following Lisa and 100 Days of Real Food for years but I’m also excited because eating real food is a great way to practice environmentally friendly habits! promotes shopping at local famer’s markets so food travels a shorter distance to get to you which uses less fuel (aka natural resources). Enough about why I’m so excited and onto a yummy recipe! We are big chili eaters in our house but I have been making the same recipe for a long time so I was excited to switch things up and try 100 Days of Real Food’s White Chicken Chili. And, with a total time in the kitchen of about 40 minutes and a difficultly level of “EASY” I was sold! 1. In a medium soup pot, heat the olive oil over medium heat. Add the onion and jalapeño and cook, stirring, until the onion has softened, 2 to 3 minutes. 2. Add the chicken and cook, stirring occasionally, until it is lightly browned on the outside and no longer pink on the inside (add more olive oil if the pot starts to dry out), 4 to 5 minutes. 3. Toss the minced garlic and spices into the pot and turn a few times to coat the chicken evenly. Add the corn, beans, and chicken broth and bring to a boil. Reduce the heat to low and simmer, about 20 minutes. 4. Break up some of the beans with the back of a wooden spoon to help thicken the chili. Stir in the cream, garnish with the desired toppings, and serve! …a thumbs up! 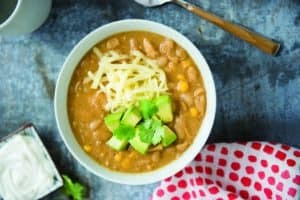 This chili was SO good and SO easy to make! The ingredients were super simple and I had most of them on hand. I ended up using leftover shredded chicken and went light on the beans since some of my kids aren’t huge bean fans. I may have gone a little heavy with the jalapeno since I heard, “This is spicy!” a few times – but it got them to guzzle down their milk! 🙂 We will definitely make this again and again! That’s just one of the many great recipes in the new 100 Days of Real Food Fast & Fabulous cookbook! I can’t wait to try more of them and hope you will too! Get Your FREE Quick Guide to Safe Kitchen Cleaners Now! Are your Kitchen Cleaners Safe for Your Family? 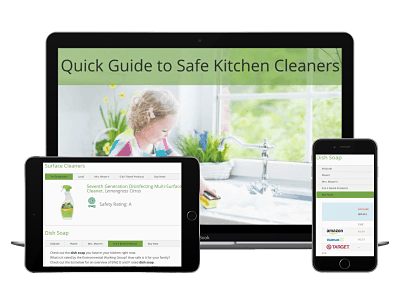 Make sure they are with this FREE Quick Guide to Safe Kitchen Cleaners - an easy-to-use list of safe kitchen cleaners AND where to buy them! It couldn't be easier to make sure your family is safe and healthy! I respect your privacy, and take protecting it very seriously. No spam!